VUE’s al-Class line array systems have achieved international recognition for raising the bar for sonic definition, through a combination of advanced transducer design and tightly integrated dsp. 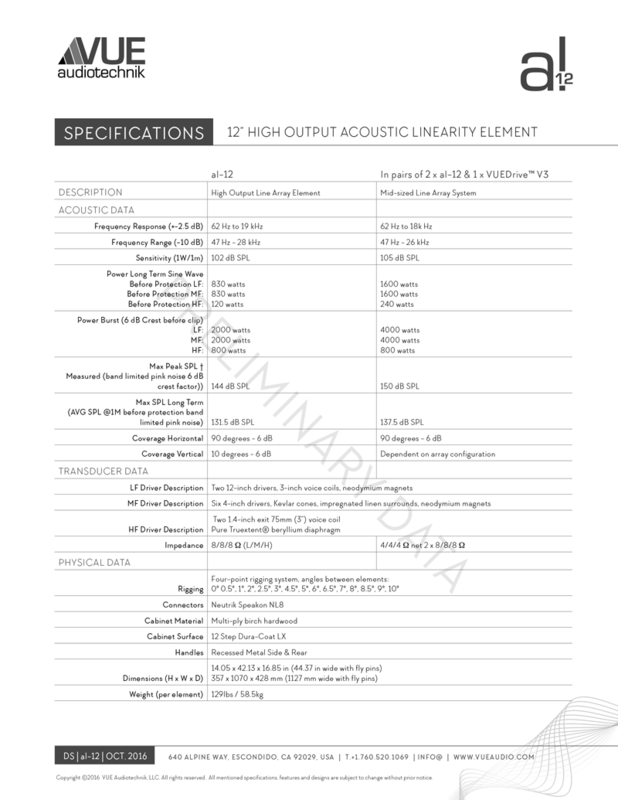 The al-12 takes the Acoustic Linearity concept further dramatically increasing overall output to expand the scale of applications that can benefit from the al-Class’ pristine sonic performance. Integrated VUEDrive™ System Engines with SystemVUE network control and Dante networking audio distribution. 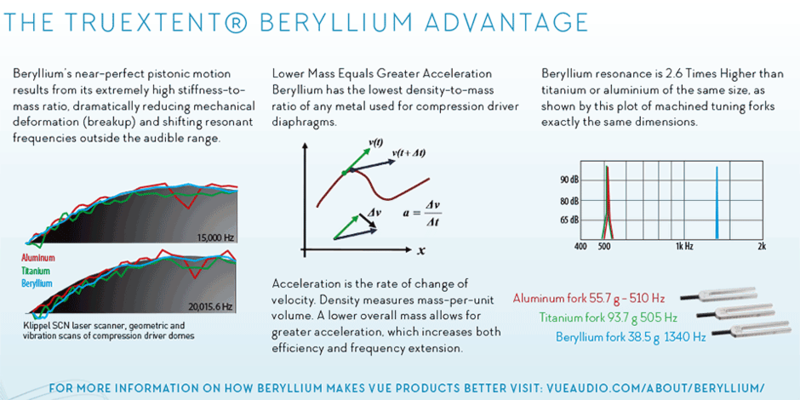 VUE has been hard at work on creating a high-output system for large-scale applications that would remain faithful to the fidelity standards established with the al-4 and al-8 systems. 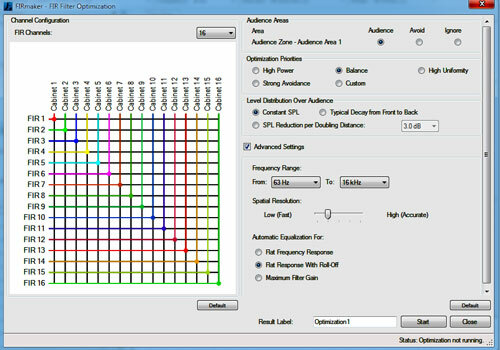 Retaining the bandwidth, definition, and linearity of VUE’s smaller line array systems while producing output levels required for large stadium applications, was no small accomplishment. In fact, it required a re-thinking of possibilities, effectively resulting in the development of a whole new set of advanced transducers, new suspension designs, and system packaging. The al-12 was designed from the ground up to cover large-scale applications while preserving the unique ability to integrate with all of the al-Class members in hybrid arrays. The al-12 utilizes VUE’s proprietary Continuous Source Topology (CST™) technology to achieve seamless performance and system scalability across all al-Class line array elements. Like the al-Class’ al-4 and al-8, the al-12 line array system utilizes VUE’s most advanced technologies and innovative designs to deliver superior sonic performance and unparalleled versatility. Cutting-edge technologies such as the new purpose-built 3-in beryllium compression driver, Kevlar/Neo transducers, precision amplification and DSP, as well as onboard SystemVUE networking and full compatibility with the VUEPoint beam steering technology, allow the highly scalable al-12 to deliver unprecedented performance to an even broader range of sound reinforcement applications. The ‘al-12 Line Array System’ is made up of the al-12 Acoustic Elements and rack-mount V3 Systems Engines. The V3 combines a highly refined DSP architecture and onboard SystemVUE networking capabilities allowing easy assembly of sophisticated networks with remote management and control available via the intuitive SystemVUE software. 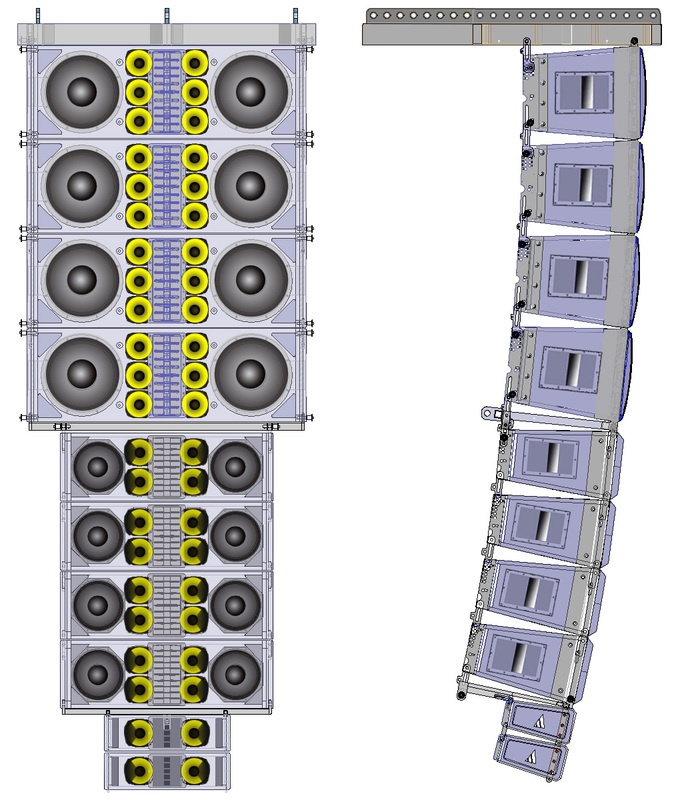 VUE’s al-Class line array systems have achieved international recognition for raising the bar for sonic definition, through a combination of advanced transducer design and tightly integrated dsp, The al-12 expands the scale of applications that can benefit from the al-Class’ pristine sonic performance. The al-12 was designed from the ground up to cover large-scale applications while preserving the unique ability to integrate with all of the al-Class members in hybrid arrays that do not ‘break the line’. Not only should this system be impressive on its own merits, it would be elemental to maintain the ability for all of the al-Class systems to work together in an optimized and coherent manner. These unique challenges forced VUE to build a whole new set of transducers and re-think the possibilities. 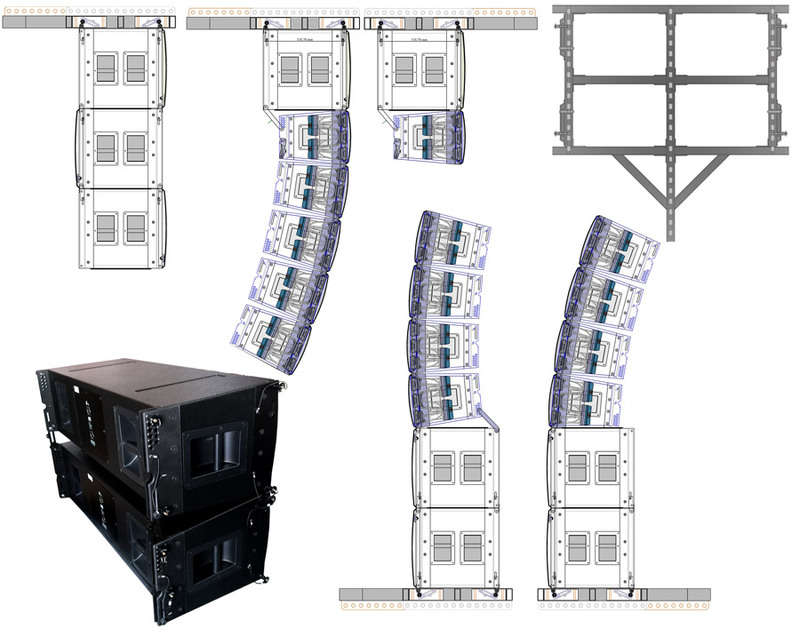 The ‘al-12 Line Array System’ is made up of the al-12 Acoustic Elements and rack-mount V3 Systems Engines. The V3 combines a refined DSP architecture and onboard SystemVUE networking capabilities allow easy assembly of sophisticated networks with remote management and control available via the intuitive SystemVUE control software. The system is powered in blocks of two al-12 enclosures, and a single V3 rack mount amplifier/DSP unit. The V3 provides 1600 watts sine wave or 4000 watts burst for each of the low and mid frequency channels, and 500 watts sine wave / 1000 watts burst for the high frequencies. The V3 is equipped with analogue, AES and Dante inputs and full ethernet based SystemVUE remote control. 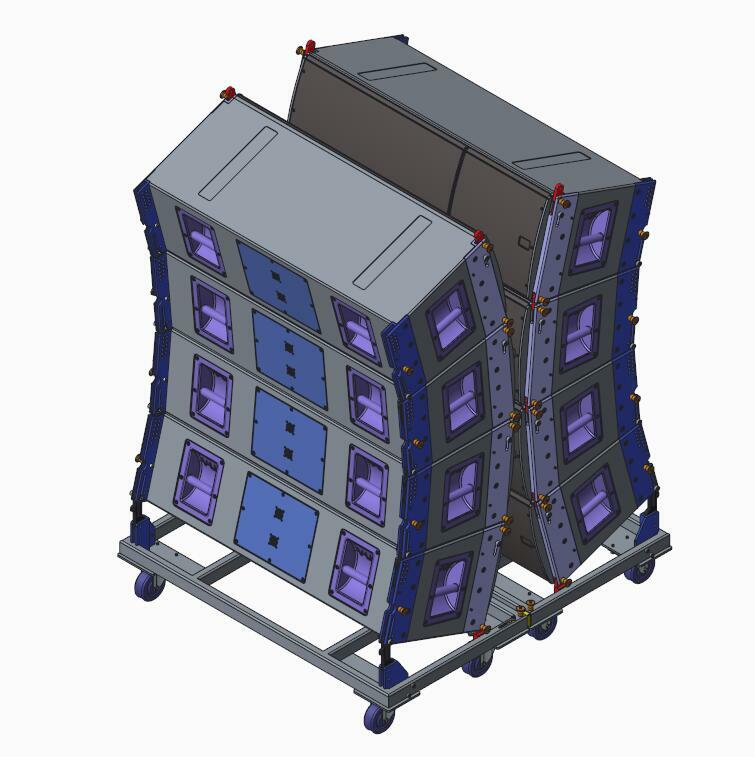 VUE is developing a modular amplifier system capable of flying with the al-12 which will incorporate identical dsp and amplification of the V3 in a higher density configuration. The system will be sold in standard blocks, with sixteen al-12 Acoustic Elements and an eight VUEDrive™ V3 Systems Engines comprising a single block. Multiple al-12 blocks will be combined to address larger applications. For applications where extended low-frequency is required, the al-12SB is a companion subwoofer system with two 18-inch Neodymium woofers optimized to provide solid low-frequency response down to below 40Hz in a very compact enclosure that can be flown in arrays along with the al-12s, in sub only adjacent arrays or ground stacked. The al-12 is fully compatible with a variety of VUE subwoofers, including the large format h-Class subwoofers.